Journalists must serve facts, not emotions. 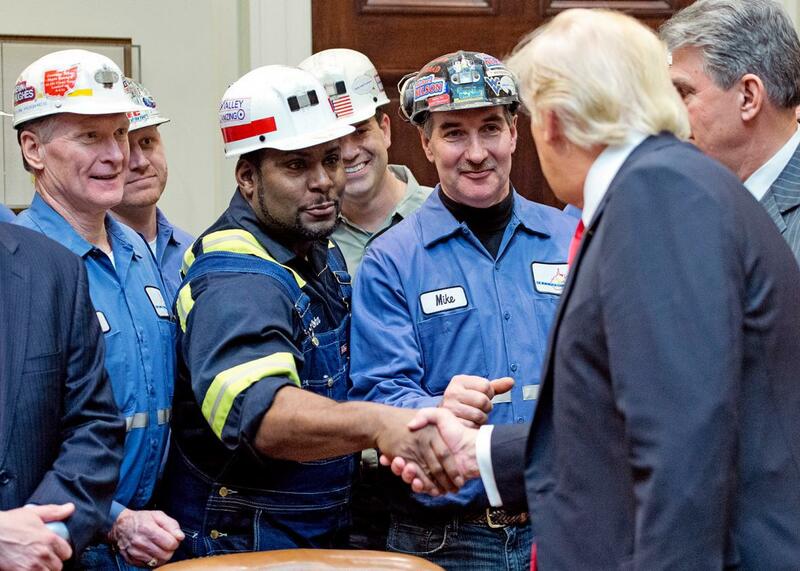 President Donald Trump shakes hands with coal miners prior to signing a rule against regulating their industry, in the White House in Washington, D.C., on Feb. 16. The problem with journalism, we were told after the election, is that we in the media focused too much on the facts and too little on the people, their stories, and their feelings. Coastal elites holed up with their precious data and forgot about the middle of the country. So on the Thursday installment of the New York Times’ daily podcast, host Michael Barbaro attempts to do his part to fix this problem. His plan? To interview a coal miner named Mark Gray. It’s a miraculous 10 minutes of radio, ending with Barbaro crying while realizing that he really doesn’t understand coal country at all, and perhaps if he just visited a mine he would have an entirely different perspective on the situation. It is emotional and compelling storytelling. But it isn’t the kind of journalism we should prioritize going forward. In fact, it’s irresponsible to the point of bordering on unethical. I don’t blame the coal miner. I blame Barbaro. It is worthwhile to seek out and interview coal miners like Mark Gray. They’ve gotten the short end of the stick, and it’s smart to try to understand how they and their communities have been and will continue to be affected by the closure of coal mines. But Barbaro has a massive platform, and his uncritical approach and deference to Gray’s claims yields a product that prioritizes wishful thinking over accuracy. No. No. That’s not so. What is so is this: You got the EPA. OK, you got your EPA, the federal government saying how we mine coal. Where we can mine coal. When we can mine coal. Obama administration said, look, you can go ahead and build your power plants, your coal plants, you’re just going to go broke. Because they’re not going to let you run it. They’re not going to let you run them. They’re not going to let you mine coal. For the last eight years, more restrictions were put on coal than 80 years. That’s it. That’s the whole nutshell. That’s all. It’s useful to understand just exactly what coal miners believe has caused their job market to decline. It’s actually quite tragic, in that sense, and when Gray goes on to explain that coal miners don’t want a handout, I feel for him. I don’t think that he should have to rely on charity, either. But I also don’t think that we should endanger the future of our planet so that he can be employed in one specific industry. Barbaro, who is not conducting this interview live, should have attempted to correct the record or offered appropriate context. Barbaro: What do you say to that idea that coal is the next in this long line of industries that are just too dangerous and need to be dismantled? Gray: Really, it’s not … coal is dangerous in which capacity? Of poisoning you, or what? Mining the coal? You can make mining the coal safe. Burning the coal? Is that dangerous? Barbaro: That’s the one people are focused on. Gray: What, the smoke? The fumes coming from coal? How many cars have you got out in the United States right now, how many cars that you’ve got out here that you’re throwing carbon dioxide and throwing out the stuff that people are saying is so dangerous? They’ve picked on one thing, specific thing, that was coal. They picked on coal. They ain’t going here picking on oil companies that do this or do that for oil. They didn’t do that. In this last section, Gray is basically demonstrating why climate change is so hard to fight—it’s a collective action problem. Because there are so many contributors, everyone has a small share of responsibility, and no one wants to personally sacrifice for the greater good unless everyone sacrifices. It’s a psychologically difficult thing to do, and I get why Gray is upset. He’s basically saying, “Why should I suffer and lose my job, when people are still allowed to drive cars?” And he’s right to be frustrated by that. It’s frustrating. Unfortunately, that doesn’t make the fact that coal is harmful untrue. And besides, coal jobs are not declining because the government wants to limit carbon dioxide emissions. But even if it was, eliminating fewer than 100,000 jobs in the interest of limiting global climate change might be a tough but necessary deal in the long run. Gray: You understand what I’m saying? Have you been to a clean coal plant before? Barbaro: I have not been to a coal—I’ve not been to a coal plant at all, candidly. Gray: You’ve never been to a coal plant? Gray: Please, go see how they use coal. I don’t know where you get your information from—the White House or Capitol Hill or somewhere like that. They don’t live here in Kentucky. They don’t live here—do these people that told you that coal was bad for the ozone layer, bad for the air, have they lived in a coal town? Have they ever been in a coal plant? No, they’re like you. But they go draw conclusions that it’s bad. That’s my take. Barbaro (crying): Yeah, I’m having a very strong reaction to what you’re telling me, because I realize I haven’t experienced the things that you’re quite rightly asking me if I’ve ever experienced. Gray: If you go see something for yourself, then you can draw your own conclusions. I’m sorry, but what can living in a coal town teach you about whether coal is actually damaging to the atmosphere? I am sure that very wonderful and deserving people benefit from mining coal. That has absolutely no bearing on the science. But interviews like this are exactly the type of thing that will cause us humans, who are emotional creatures, to make less logical decisions about the future of our planet. Combating climate change requires us to make sacrifices now for benefits far down the road. Years, decades, or maybe centuries down the road. The children who will benefit from us lowering our emissions can’t be interviewed on the Daily because they don’t exist yet. That doesn’t mean we shouldn’t consider them. Gray: Yes it has. It has a real future. It has a future. Barbaro: How does it have a future? Gray: You can mine coal. You can mine coal safe. You can burn coal. You can burn coal clean. It has a future, if they would just unregulate it. You know? Companies will come back. Men will go back to work. Slowly. But yeah, surely. Once again, the concept that all we have to do to help the coal industry regain jobs is deregulate it is false. It is cruel to allow Gray to continue to believe this. It is also irresponsible to elevate his opinion on the matter. Gray is not an expert in this field. He is someone who has lived this, yes—and that means that he has a deep vested interest in believing that deregulation will give him his job back. It’s certainly what coal companies want miners, and journalists, and everyone else, to believe. But if this is the kind of journalism that results from our new attempt to reach the middle of the country, we will all end up living in Trump’s reality—one in which facts no longer matter.